My friends are seriously the coolest people . . . EVER. Not just because they love playing hours of Beatles Rock Band as much as we do. Not just because they share in our love of beer-cheese fondue. Not even because they're just so darn cute (I mean, LOOK at them!). No, it's because they take the time to visit us . . . and do other cool things with us. Like what? 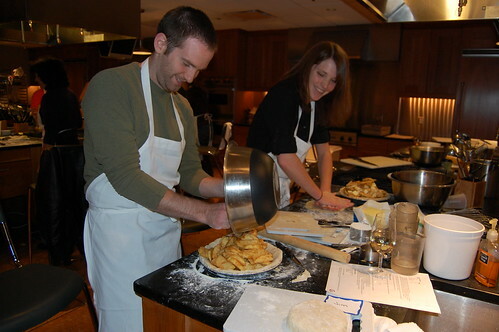 Like participating in an apple pie baking workshop. Oh, hells yes! 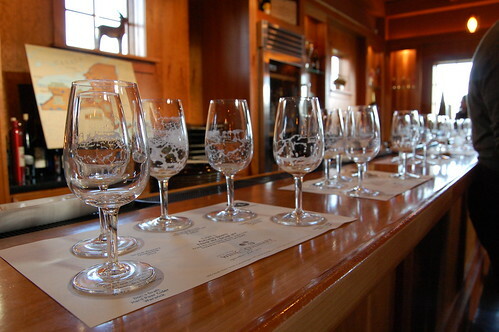 In mid-October, we all drove from our separate cities to the The New York Wine & Culinary Center in Canandaigua, NY. 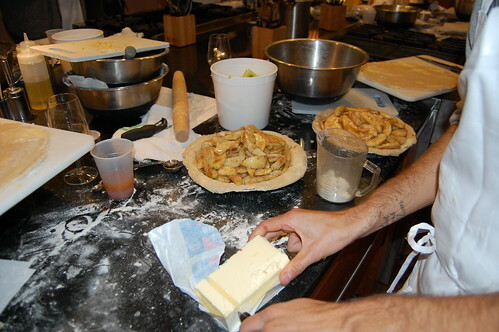 The mission: To create the most amazing apple pie possible. The weather was incredible -- it was the weekend before NY's first snowfall, and the leaves were nearing their peak. Canandaigua is a cute town that sits at the top of one of the Finger Lakes in upstate NY. As the Center's name implies, there's also a lot of great wine (and beer, actually) in the area. Of course, we did a bit of taste testing . . . 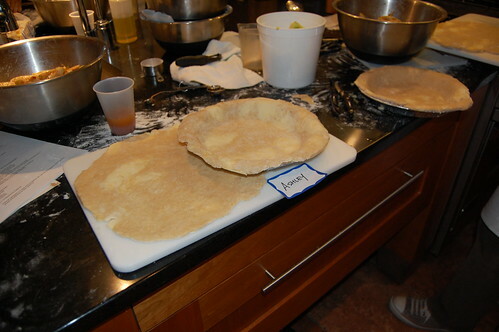 Anyway, among many things that day, we learned some valuable tips and tricks for making flaky pie crust. Use shortening AND butter -- and don't blend the pats of either ingredient into the flour very much. The pockets of fat help create the flakes in the end result. Cider is an awesome liquid to substitute for water in apple pie crust. Don't worry, though, if your crust looks darker as it bakes (something about how the sugars make it caramelize). Mix by hand. 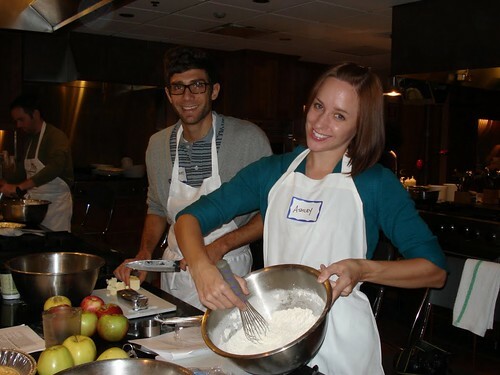 And -- your mixing is "done" when the dough has reached a "shaggy mass" consistency. The words "shaggy" and "mass" together make my friends laugh even to this day. When you roll out your crust -- again -- you should see big chunks of fat (see my BEAUTIFUL example below -- I'm a star student. Hah!). That means you're moving in the right direction. 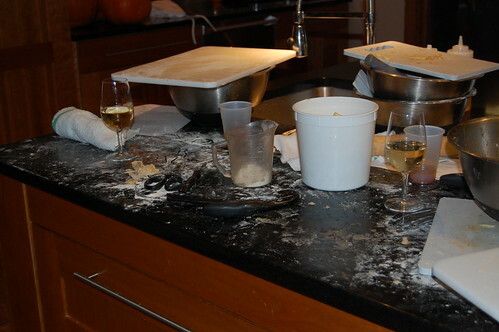 If you eat too much of the raw dough, you may not have enough left to cover your pie. In the end, my favorite part was not having to clean up after myself in the kitchen. Oh, and they gave us free wine . 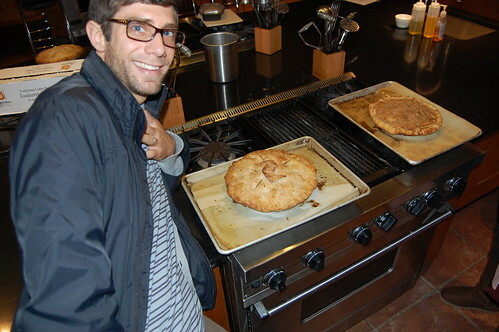 . . AND watched our pies while they baked, allowing us to roam around for a couple hours. From experience and what I have heard, all the pies turned out wonderfully. The whole day was perfect: food, friends, and -- yeah -- fun. Bottom line? 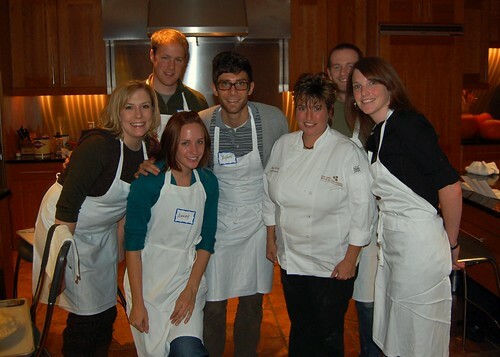 TAKE A COOKING CLASS WITH YOUR FRIENDS. It's a great way to spend your time . . . it's educational . . . it's tasty, etc. 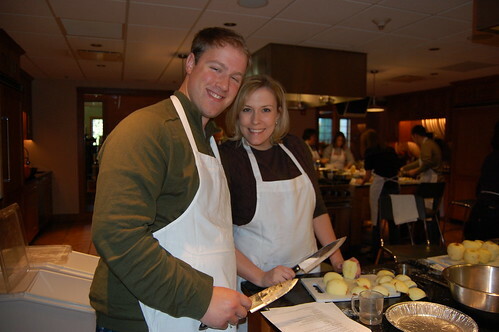 And if you're in the NY area, check out The New York Wine & Culinary Center -- we're already planning our next class. Hopefully something that involves chocolate.